THERE was a time when the Formula 1 circus missed going to Adelaide and thought that Melbourne was a louder and brasher cousin of pleasant, small town Adelaide. All you can say is that the F1 circus has done some growing up in recent years and now Melbourne is as popular in the paddock as Adelaide ever was. A sign of the times perhaps, but a reality. It is a brilliant event and the city has embraced it as it was always supposed to do. This year there may have been a few of the old fossils protesting about the misuse of Albert Park, but if they were there, they were invisible. Everyone has realized that they were just silly people with nothing better to do. The park is flourishing, the city is booming and former Premier Jeff Kennett's dream of turning Melbourne into an internationally-flavored and renowned city has become a reality. Kennett was squished by the mincer of the electoral process last year but his rival and replacement Steve Bracks, whose party whinged for years about the race and supported the protesters with the yellow ribbons, suddenly woke up in power and realized that it would be very foolish indeed to get rid of the Grand Prix and so immediately embraced Ron Walker, the boss of the Grand Prix and (in his spare time) the leading money-raiser for the Liberal Party. If they are smart - and all the signs are that Mr. Walker has a fairly active brain beneath his haystack hairdo - the city will go on hosting the race for many more years to come and the image of Melbourne will rise ever higher on the global list of good places to go. It is beginning to work. When you read those inane stories in the in-flight magazines about the great cities in the world the name Melbourne is just starting to creep onto the bottom of the list along with Sydney, San Francisco, New York, Cape Town and so on. There was a time when the first race of the year was more stressful than others but today in F1 it seems that all the races are stressful because of the ever-increasing pressures on the teams. Melbourne, being the first event of the year, has the added twist that it is the race when the wrappers come off the gorgeous, lithe models with wheels at each corner and the world gets to see all the nips and tucks and silicon implants. The winter months have been spent with everyone messing about at the testing circuits of Europe, but in Melbourne the negligees come off the F1 cars and the teams have to face up to the reality that McLaren is still the Helen of Troy and the backmarkers are the girls who end up sobbing in the changing rooms after the prizes have been handed out at the Beauty Contest. Ferrari has tried year after year to steal McLaren's crown and every year when it comes to those 60 minutes of qualifying, the grey gang from Woking show the glamorous Italians that it is all very well to be flashy but quick is quick. What was most impressive this year was that Mika Hakkinen was able to take pole position having had his car stop beneath him on the first lap of the morning session with an engine failure. That is about as bad as it gets on a Saturday morning without contact being made with the walls because the drivers are not allowed to leap into spare cars. They just have to sit there and watch as their rivals do their homework and they know that it is going to be guesswork when it comes to the exams in the afternoon. The Finn ended up doing just a handful of laps at the end of the second morning session after the McLaren mechanics gave his MP4/15 a very rapid heart transplant and stuck in a new Mercedes-Benz V10 that would work. He may not have had many laps but it was just enough to give him some clues as to what to do. The result of all this was that Michael Schumacher's Ferrari continued to be fastest - as it had been on Friday. But when it really mattered the red cars of Maranello were at least half a second off the pace. And just to make sure that Ferrari ended up feeling a little on edge, McLaren boss Ron Dennis remarked after qualifying that "it is going to be four races before we can truly establish our competitiveness". What did he mean? Will it be four races before McLaren knows where it stands in relation to Ferrari? Or four races before McLaren knows were it stands in relation to its expectations? Hakkinen's performance on Saturday afternoon was an indication of why he is a twice World Champion. Lesser men would have been in a flap and would have made a mess of it in the afternoon. There would certainly be plenty of excuses available. But he nailed the McLaren to the top of the timesheets on his first flying lap and the only time he was knocked off the top was when his own team mate took advantage of the extra running he had in the morning session and snuck ahead. Hakkinen came out of the pits like a shark in an ornamental pool and bit a chunk out of David Coulthard's confidence on his second run and then, just to prove the point, he ended the session clipping another tenth off his best. Coulthard is a tough cookie but every year Hakkinen does the same to him and everywhere you can almost hear the sharp intake of breath as the Finn's teeth sink into Coulthard's ambitions. David had the advantage and Mika had clawed it back. When David went for one last blast to salvage the situation he spun the car around and backed it heavily into a wall. In fact he was doing himself a favor because the crash brought out a red flag which meant that the other Coulthard-eating shark of the F1 circus, Michael Schumacher, was unable to finish his final fast lap and so stayed in third place on the grid. It must have been a bit frustrating. "I am not bothered about third," he said, trying to sound plausible. "With a long hard race ahead, grid positions will not be so important for the final result." Both the Ferraris looked to be struggling as they tried to squeeze the extra hundredths out of the F1-2000 chassis. It was no coincidence that both men joined the rotary club of drivers spinning down the roads. They avoided hitting the walls. And while you may think that this is not very significant it is worth asking when was the last time that Rubens Barrichello went for a spin in a race car. Rubinho has an uncanny ability to avoid such time-wasting activities. The Brazilian did a good job and was only a few smidgens away from Schumacher's best time - which is something which Eddie Irvine rarely managed to achieve in recent years. "The car was very well-balanced," said Rubens, "and I felt everything was in place for either Michael or me to take pole." Nice idea, shame about the reality. The third row of the grid gave an indication of the fact that the Jordan is the third fastest car this year. There was Heinz-Harald Frentzen alongside his new Jordan team-mate Jarno Trulli. They were separated by a tenth but one could not help but feel that the Italian could have done a lot better. Frentzen reckoned he could have gone quicker if he had not had traffic and flag problems (and had not glanced a wall) and was rather disappointed not to have beaten the Ferraris. Trulli's performance was sparkling although he was a 0.15s slower than his team mate he did it having had only one qualifying run in his own car. This then ran into software problems which lunched the gear selection process and so Jarno ended up in the T-car which was set up for Frentzen. He never improved the time of his first run but it is clear that when he does get the chance he is going to make Heinz-Harald work hard to stay ahead. "Not bad for a complete disaster," said technical director Mike Gascoyne. Seventh on the grid went to the Jaguar of Eddie Irvine which was not a bad effort given the chronicle of technical problems which could have been written about the team. "It has been a total disaster," said Johnny Herbert on his adventures on Friday. Things were not much better on Saturday but Irvine was able to keep it all together for a one important lap. "I honestly didn't think we could qualify that high up," he said. Poor Herbert had not such good fortune. His qualifying was ruined with a string of engine problems, a power-steering failure and then another engine problem on the spare car. "This is the worst pre-race build-up I can remember," he said. "The whole thing is very frustrating. I didn't get any chance whatsoever of setting a time." He ended up 20th on the grid. The Jaguar publicity all around Melbourne said: "The Cat is back". It should have said "The Cat is at the back". No money was changing hands on whether the Jaguars would be finishing the race on Sunday. Eighth on the grid was a bit of a surprise. Jacques Villeneuve in the BAR-Honda. The pre-race testing did not suggest that we would be seeing the mobile Japanese flag this far up the grid, despite the obvious grunt which was coming from the lump of exotic metal behind the driver. The BAR seems to be a car which is quite quick when it is right and a real handful when it is not. In Kyalami the car was pretty much on the pace but at Jerez it was a disaster. Villeneuve has always gone well in Melbourne and likes the Albert Park track so he was looking pretty good. Ricardo Zonta was having less fun and ended up a miserable 16th on the grid. "We went the wrong way on set-up this morning and that meant we weren't able to do a back-to-back comparison between new and scrubbed tires," he explained. "That would have helped." Things were pretty tight in the midfield so a small problem could mean the difference between eigth and 14th with the Supertec engined brigade mixing it with the Sauber Petronas V10s and the BMWs. In the end it was Giancarlo Fisichella who won the battle of the Supertecs with ninth place on the grid. The 775-horsepower engines are bigger and heavier than the newer units and produce less grunt. As they get older they gradually slip backwards on the grids. Two years ago the fastest of the engines was fourth on the grid, last year it was seventh, this year it is ninth. The pricing of the units remains inversely proportional to the performance with the price tag for a Supertec now edging up to the $24m mark. In this area of the grid everyone was busy mumbling about how they should have done better than they did and making lots of excuses about mechanical troubles, traffic problems, nuns crossing the track and other unlikely tales. When you have wowed the big sponsors with amazing testing times you have to have some good excuses when you are back in the early teens on the grid. Fisichella did a pretty good job to be ninth and said he was fairly satisfied with the result. Alexander Wurz was 14th and not as happy. The Austrian said that he had been "ridiculously unlucky" with traffic. The Benettons did not look to be handling as well as the Arrows but they came out ahead on this occasion. Ahead of the Arrows, however, were Mika Salo's Sauber Petronas and Ralf Schumacher's Williams-BMW. The Williams-BMWs were 11th and 21st on the grid and there were a few glum faces in the pits because they figured that Ralf Schumacher could have been in the top six... At the end of the day, however, it was a fairly strong performance from BMW - more than was expected. "The gap to the top teams is not as huge as we thought it would be," said BMW boss Gerhard Berger. Ralf Schumacher had throttle problems and a lot of time was wasted while Jenson Button had one of those F1 debuts that you just don't want to have. On Friday he demolished a passing bird which ended up in his lap and spoiled his nice white overalls. But things did not go seriously wrong until Saturday when he dropped the ball after just a handful of laps and smacked the car into a wall. It was all part of what people in F1 like to call "the learning curve". He then lost the rest of the morning session and so went into qualifying with a car that was not set up at all. Then there was a misfire which could not be cured and so he jumped into the T-car which was set up for Ralf. He was just winding up for a final flying lap when the red flags came out and poor old Button (or rather poor young Button) found himself 21st on the grid. It did not reflect what he might have done and in the Sunday morning warm-up, probably just to prove a point, he was second fastest with a time which was 1.1s faster than he had managed in qualifying. It would have bumped him to 15th on the grid, which would have been respectable. Jenson was the only man in the field to choose the harder of the two tire compounds so perhaps he was going to get an advantage if the temperatures went high on Sunday afternoon. There were lots of ifs and if onlys but for anyone with half a brain it was clear that Jenson deserves his place in F1 and will prove it in the months ahead. Down in the Arrows area everything was very orange in color but the result was a little less sweet than one might have expected after such hurtlesome testing times in recent weeks. Twelfth and 13th on the grid for a car that was supposed to be faster than the Battleship Galactica was not brilliant but, then again, there were very few people in the F1 paddock who thought the cars would be much better than that. Setting fastest times in recent tests was more a marketing exercise than a technical one and everyone knew it. But, given the mess they were in last year, this was a good step forward for the team which is a good thing because there are some very good and very motivated people at Arrows. Pedro de la Rosa outqualified Jos Verstappen by a tenth which was a bit of a surprise. The Prost-Peugeots were pretty dreadful but it was not a surprise. The new Peugeot engine is not going anywhere in a hurry and the performance adds to the belief that Peugeot's future rests very firmly in the World Rally Championship. Nick Heidfeld outqualified Jean Alesi which was an indication of the kind of problems the team was having. The Telefonica Minardi Fondmetal was pretty much where one would expect to find it with Marc Gene unsurprisingly faster than Gaston Mazzacane. If everyone else had not had problems the two cars would have been sharing the back row. QUALIFYING is one thing, but as has so often been shown in the past the race is another matter. In the case of Prost Grand Prix there was no great change on Sunday. Alesi had "an electro-hydraulic" problem with the engine in his race car and had to start in the spare from the pitlane. Ralf Schumacher and his engineers decided to switch to the spare car because the engine in that seemed to be better after the warm-up session. This had seen Rubens Barrichello fastest from Button, who recorded a lap which was 1.1secs faster than his qualifying lap. The locals streamed in all morning and by the time the grid had lined up for the start there were 124,000 people in the park. There was plenty of excitement. When the lights went out the field was unleashed towards the first corner and it was Hakkinen who made the best getaway although Coulthard was right with him. Schumacher's Ferrari was rather slow away and this enabled Frentzen to try a move on the outside of Michael. The Ferrari however was very wide and it was Michael who emerged third in the first corner with Frentzen fourth, Barrichello fifth and Jarno Trulli sixth. Then came Jacques Villeneuve. Irvine was the big loser, dropping from seventh to ninth. Further back in the field Button made a storming start to move from 21st to 15th in the course of the first lap. "My start wasn't the best in the world," he said, "but some people had worse so it wasn't bad. The first lap was very hectic but I tried to stay out of trouble." Herbert's weekend from Hell continued. In the second corner his clutch started to slip and by the end of the lap his race was over. Also in trouble was Marc Gene who collided with Nick Heidfeld in the first corner and bent a steering arm which meant that he had to pit for repairs which dropped him a long way behind. Up front there were no problems for Mika Hakkinen as he accelerated away from the field. He was nearly two seconds ahead by the fourth lap but then the gap to Coulthard stabilized. The two McLarens were leaving the Ferrari behind. 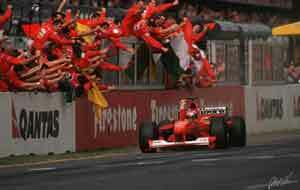 Later Michael Schumacher said that he was taking it easy, but the fact is that he could not keep up. But now the question was whether or not the McLarens would survive and we would discover that the answer was no on lap 10 when David Coulthard suddenly slowed and went into the pits with a misfire. There was a problem with the pneumatic valve system. David rejoined but he was out before the end of the next lap. Hakkinen's early lead had been lost because of a safety car which was despatched to enable the marshals to pick up the bits and pieces of Arrows left over after Pedro de la Rosa suffered a steering arm failure and smashed into the wall in the high-speed section on the far side of the circuit. The accident also put paid to Eddie Irvine's race, ending Jaguar's ever so slightly inauspicious debut. Arrows did not trouble us for much longer. Soon after de la Rosa's smash, Verstappen suffered an identical failure but avoided demolishing his car. He pitted, had a new steering arm fitted and then rejoined but after the team had a chat with de la Rosa it was decided to withdraw Verstappen lest there be another identical failure. Orange's ambitions were squashed. It would not be long before McLaren's hopes of victory went west. On lap 19 Hakkinen's car suddenly slowed with a trail of white smoke from the rear end. It was the same problem which had sidelined Coulthard - and which had caused the engine failures the previous day. To bastardize Oscar Wilde, "to lose one engine is unfortunate, to lose two is careless". One wonders what the great wit would have said about losing four? With the field thinning itself out we were left with Michael Schumacher with a massive lead over Frentzen, who had Barrichello right up behind him but well and truly stuck. Trulli was cruising along behind them, conserving tires and looking as though he would be in a good position to pounce during the pit stops. Schumacher pitted on lap 30 and was able to get out of the pits in third just ahead of Trulli. In the six laps which followed Jarno lost 10 seconds and one could not help but feel that Ferrari had orchestrated the move to protect Barrichello. There is no doubt that the Ferrari had a heavy fuel load and new tires and so was a bit of a handful but it looked like a bit of strategic blocking. Ferrari is not above such low tactics. Whatever the case Trulli's hopes were ruined, although he would retire on lap 36 with an exhaust problem which caused an engine failure. Ferrari called Barrichello in on lap 33 and it looked like a normal mid-race stop. It was a fairly quick one but it did not look out of the ordinary. In fact Ferrari had decided to switch Rubens on to a two-stop strategy. It almost went horribly wrong when Barrichello found himself stuck behind Button when he rejoined, but Schumacher's delaying of Trulli and the disappearance of those ahead of him opened the way for Rubens to put in some really quick laps. With Frentzen disappearing with a hydraulic leak (after a long pit stop caused by a jammed refuelling valve), Barrichello had no-one in his way and so he quickly caught Schumacher. He caught him so quickly that it looked like Michael had a problem. On lap 45 Rubens overtook Michael for the lead. On the next lap, however, Barrichello came into the pits for the extra fuel he needed to get to the flag. Once again the move was open to misinterpretation and it looked as if Ferrari had deliberately called him in to get Michael back in the lead. But it wasn't like that all. It was a two-stop strategy. It wasn't actually needed because the disappearance of Frentzen solved the problem for Ferrari. Whatever the case, Schumacher and Barrichello were 1-2 at the front and that was how they finished. It was a great victory for the team and the perfect start to the year. Ferrari 16, McLaren 0. After the race Schumacher made much of the fact that the Ferraris were as quick as the McLarens but it never really looked as if they were right there. We shall have to see what happens in Brazil. In the early laps there did not seem much likelihood of Williams-BMW getting a great result. Ralf Schumacher was running 13th and Button 15th. The disappearance of the two Arrows and Irvine bumped them up to 10th and 13th (Jenson having lost a place to Wurz). When the McLarens disappeared they were eighth and 11th and there they stayed until the pits stops began. And then we saw some magnificent work by the team and both drivers. When the pits stops were over Schumacher was third and Button sixth and there they would have stayed to the finish had Button's BMW engine not failed on lap 47. For Ralf it was a great result and totally unexpected. For Button it was a quite brilliant debut and it silenced all those of the chattering classes who had doubted that he had what is needed to be in F1. A star was born - even if he is only 20. "I made a mistake on the fifth lap," he said, "but apart from that it was neat and tidy, certainly a good start to my career in F1. I think I have shown that I can do the job." Indeed so. Fourth position at the flag went to Jacques Villeneuve, scoring BAR's first points. There was a certain element of luck involved but Jacques stayed out of trouble and the car ran faultlessly and that is what matters. It was a good solid result and a reward for a lot of hard work. To add to the achievement Zonta finished seventh and would later be awarded sixth place when Mika Salo was excluded for a front wing infringement. The team is not yet out the woods but a result like that will certainly have helped. Benetton picked up two points thanks to the efforts of Fisichella who came home fifth. He had some problems with the rear of the car after the de la Rosa/Irvine accident. "The rear of my car became really loose and I had massive oversteer in the corners." Alexander Wurz also made it home in eighth place, although this became seventh when Salo was booted out. Sauber's day had looked to be quite good until the scrutineering bay. Salo had finished sixth but the front wings of the car extended backwards an inch into an area where bodywork is not supposed to be. There was no argument, Salo was out. Pedro Diniz had a brush with Zonta and ended up in the gravel. He rejoined but eventually had to pit for repairs and on lap 43 he went out with a transmission failure. Marc Gene made it home in ninth (which became eighth) but it was not a great day for Minardi. The Spaniard's race was hampered by his collision with Heidfeld while Mazzacane's GP debut ended in retirement on lap 41 with a gearbox failure when he was running 11th. Heidfeld managed to drag his recalcitrant Prost home in 10th. Heidfeld said he was happy. He must be easily pleased because this had been a terrible weekend for the team. Alesi's race in the spare car was uninspiring and ended with an engine failure.